Now, the thing about Sugababes is that their musical output was quite often overshadowed by all the catfights and internal drama the group had, not to mention the continuous changes in the lineup, which has led to no original members being left in the current lineup, "Sugababes 4.0". However, as evidenced by their reunion officially announced in 2012, at least the first incarnation of the group has successfully buried the hatchet. 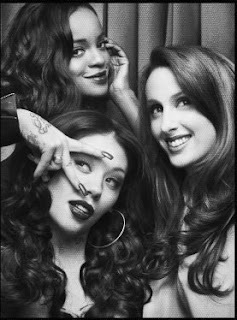 The trio - consisting of Sugababes founding members Mutya Buena, Keisha Buchanan and Siobhán Donaghy, named not so cleverly 'Mutya Keisha Siobhan' (really?) - has an album coming out but unfortunately it won't come out until early 2014. Worry not, though, as they do have a couple of songs out already, the first one being their debut single "Flatline". The song, while not really that remarkable, showcases the wonderful harmonies that Sugababes should really be remembered for. Judging by the song, MKS are apparently going for the Florence + the Machine kind of a big pop sound with nearly tribal drumming and everything, aren't they? Seriously, add some harp parts and her vocals and this would make an indistinguishable Florence song. Not that I don't like her, she's lovely. Not so fast, though: they do have another song out, too! Well, kind of. Earlier this year their producer Dev Hynes uploaded a brand new MKS song on Soundcloud. Heavily sampling Kendrick Lamar's 2012 single "Swimming Pools (Drank)" (or perhaps being more of an interpretation of it), the track features a much more urban sound than "Flatline" and, to be honest, is about a thousand times more exciting. Too bad Hynes announced that the dark-sounding "Lay Down In Swimming Pools", complete with their trademark harmonies, will not be included on their forthcoming album - except it will, albeit in a new version, as confirmed in the group's Idolator interview. In addition, there is some other new stuff floating around in the internet, namely Youtube, but it's all live footage captured with mobile phones so the quality is what it is. Meanwhile, enjoy the two tracks above!